The draw for the second round of the FA Vase was made at Wembley at lunchtime with seven local Sussex sides still in the hat. Giant-killing Steyning Town will travel to the Ashford United in the second round, Loxwood will be away to Colliers Wood United and Haywards Heath Town face the beautifully-named Tafley Calleva. In the home ties, Pagham welcome Thame United, Newhaven host Camberley Town and Eastbourne Town are at home to Greenwich Borough, and Hailsham Town will entertain Ascot United. 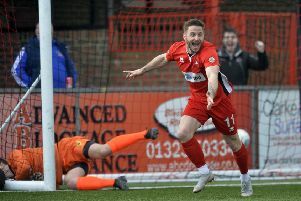 The Barrowmen produced arguably the shock of the round on Saturday as they downed division-higher local rivals Horsham in extra time. They will enter the second round proper for the first time in their history. The 64 ties will take place on Saturday November 21, with winning clubs receiving £1,000 from The FA’s prize fund.